The new year is a classic time to take a moment to reflect on the past and plan for the future. I’ve been spending a bit of time looking back through the years of photos I have. TONS of photos. You have tons, too, no doubt. I found this little forgotten gem of a pic, which I’m titling, Still Life with Stinkbug. Not sure it’s a stinkbug, but I figure I can take liberties. Besides waxing nostalgic over old photos, my main resolution for the year is to develop an online gallery, a place right here on this web page where you might could purchase a pot from me. So check back now and again, ok? I don’t know how far I’ll get, but I’m gonna at least move forward. Which bring us to my mantra for the year: Just keep swimming! Announcing our first annual holiday HOME SALE! Come by Saturday, December 8 from 11-4 and get. you. some. POTS! Perfect time to pick up gifts for the ones you love. Most likely will have tasty snacks. Texas Clay fest, y’all! Be there! We will be:) Find more info here. Summer is here!!! I'm not too excited about the impending 100 degree weather, but I do love having a bit more freedom in my schedule. I have a To Do list that will take waaaayyy longer than one summer to complete, so I'm gonna be busy! I recently started showing work at a local Waco arts space called Cultivate 7Twelve. They're at 712 Austin Avenue, right in the heart of downtown Waco. Depending on when you know your Waco, you might remember it being the Croft Gallery. Or maybe as a bakery? Anyway, check 'em out, they've got a LOT of activities going on. We've had TONS of rain here in Texas, and temperatures are finally starting to warm up. Up at school we hosted a great workshop featuring the wise and wonderful Waxahatchie artist Carl Block. To see some images from his show and studio visit, as well as see the face jugs he inspired the students to make, take a peek at the Extra page. Included is a short video of him throwing on the wheel- what a pro! I've been busy working in the studio, getting ready for an upcoming wood fire, and also a gas kiln, and maybe even a soda kiln, too! Niko and I will be giving a fly by lecture and demo down in Austin for the Greater Austin Clay Artists Group, more info on that here. Happy Spring y'all! There are *many* things I love about ceramics. I could go on and on and on and on. One of my favorites is the community. Clay people stick together; we openly share our recipes and techniques with each other, we depend on each other as we load and fire kilns, and we bond together to market and sell our work. We also put on AMAZING spreads of food and drink. For reals. One group I am particularly pleased to be a part of is the Pottery Friends. The current group consists of Chris Gray, Jillian Cooper, Karen Hamilton, Brandon Phillips, Chris Melia, and Niko Weissenberger. Past members, still friends include Annie Chrietzberg, Ryan McKerley, and James Tingey. 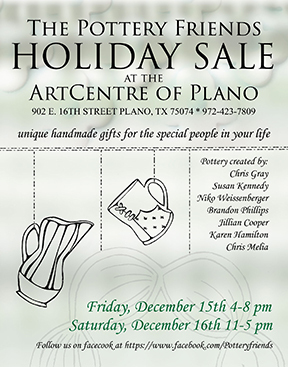 For the last several years, we’ve been putting on a holiday sale at the ArtCentre of Plano. Well, we’re at it again! We’ll be at the newly renovated ArtCentre of Plano on Friday, December 15 from 4 to 8, and Saturday, December 16 from 11-5. We’ll have lots of pots and tasty snacks and sips, too. For more info, directions, and to see all of us artists, you can follow The Pottery Friends on Fb here. Hope to see you there! Happy Holidays to you and you and you! For those that are interested, click here to hear the best Christmas song ever. As school starts, and the weather (hopefully) cools, there are lots of things happening. The Art Center of Waco is launching its Exhibit on the Go, which will turn a trailer into a mini gallery space, fill it with art, and bring it to area schools. I am happy to be part of the show. 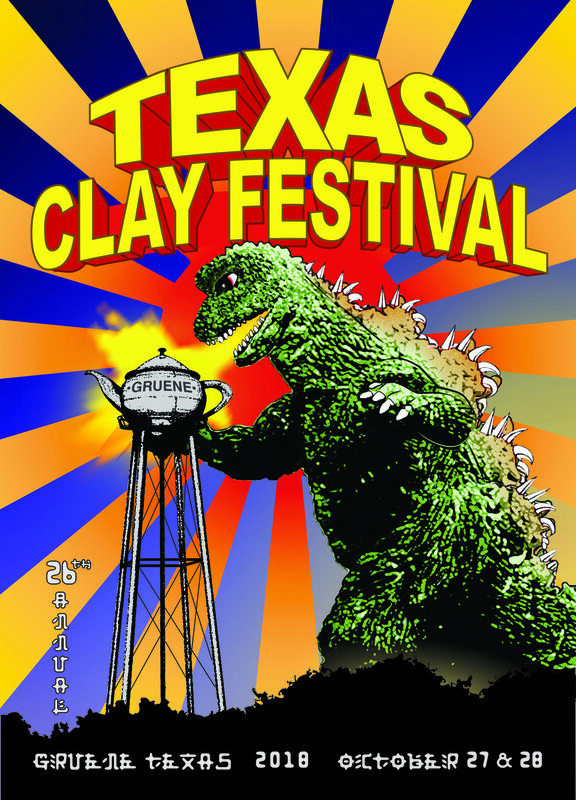 The Texas Clay Festival is fast approaching, save the dates: October 28 and 29 in Gruene, Texas. Be there, or you're a square! For a little eye candy, check out some pictures from my blue flower planting through the midwest here. The cliche is true: the older I get, the faster time moves. I can't believe we are already on the brink of summer! While I'm NOT looking forward to the Texas heat, I am excited about some upcoming events and opportunities. I'm also super jazzed to get some dedicated studio time- a chance to make without interruption is egg in my beer. For Waco area peeps, I now have work featured in two local art spots, Interior Glow and The Art Center of Waco. Stop by sometime and take a peek! If you're a bit further south, say in San Marcos, you could check out my cup in The Eye of the Dog's 1st Annual Mug Show. Their Dirt Dauber Festival will be held May 20-21, and is a fantastically fun clay family event, full of great people and potters. I've gotten off to a slow start after the new year, but I am rallying. The group of pots shown here is making its way to The Lion's Nest in Austin, and will be available for purchase just in time for SXSW. I am also (slowly) working on putting some pieces into my Etsy shop. Hopefully, I will soon line up a gallery in Waco, stay tuned! Soon we will fire both the wood kiln and the soda kiln, so I need to get busy and make some fresh work. Being a podcast addict, I am always looking for new, interesting things to listen to while working in the studio. If you have any suggestions, please let me know! To see what's happening in the studio, check out my Facebook page. For a peek at what I am looking at, check out skennedyart on Instagram. Here in Central Texas, I am happy to report that we’ve made it through another hot Texas summer and into cooler fall weather. This is an especially busy time of year for me, what with the start of a new semester and the preparations for my favorite event of the year, the Texas Clay Festival. More information about that here. I’ve just unloaded some fresh pots from the soda kiln. To sneak a peek at those, check out the 2016 Gallery. 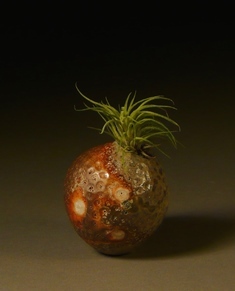 This was the first firing with my newly hacked sprayer wand, which worked great. If you’re interested, there are directions by Glenn Dair on how to do that here. We started out the summer with a (too quick!) trip to Canada. I was so busy looking at all the beauty around me to take too many photos, but here is a shot of gorgeous Banff, with a small plant of mine in the foreground. As summer stretches before me, I have a long 'To Do' list. I consider this a great start! As part of the "Texas Clay" show, of which I am happily a part of (more info on that here), Niko and I will be at Collin College in Plano giving a talk about our practice of making art. I might throw in some poetry as well. From 4-7pm on Thursday, April 28 (same day as the lecture) there will be a reception for the show, which was curated by Chris Gray. 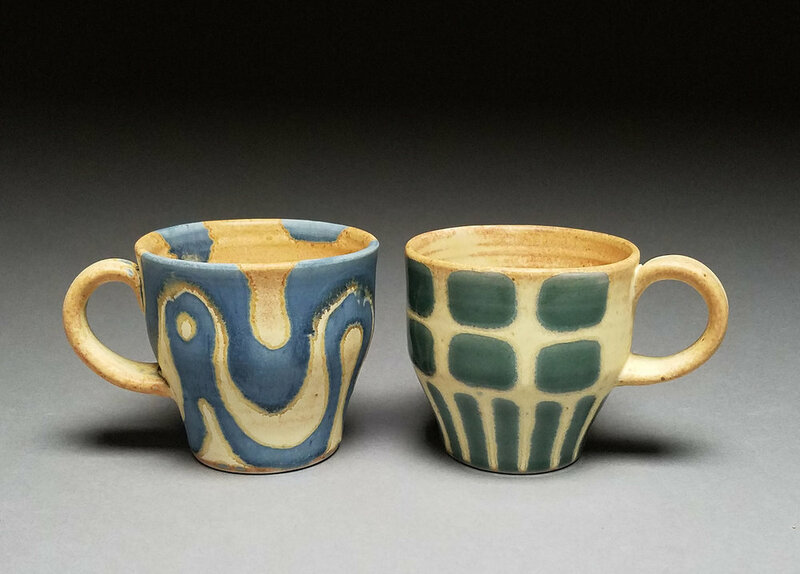 Show participants include some of my most favorite-est Texas ceramists: Annie Chrietzberg, Jillian Cooper, Ryan McKerley, Christopher Melia, Brandon Phillips, James Tingey, and, of course, my most favorite of all, Niko Weissenberger. Fairly often I leave small pieces in Cameron Park, in Waco near where I live. In the past, the art plantings have been casual and random. But there is a big (HUGE) log at the start of the trails that I usually pass by when walking with the dog. It got me to thinking. So I decided to make a grouping specifically for that spot. Below are some images of the work in progress, and in place. I love the shot of the kids on the stump the most! My hope is that anyone who happens along and snaps a pic will send it my way over at https://www.facebook.com/skennedyart. Cheerio! If you'd like to receive the "Coffee Party" postcard featured here, just message me your street address. I have plenty (perhaps I over-ordered?! ), so don't be shy. Also, I have added a short video showing us dropping out the arch form back when we built the soda kiln. I am happy to report that we have fired the kiln seven times now, and the arch still looks good. If you'd like to see the build pictures and the video, check out Soda Kiln Build under the Events page. Photo by Adriann Freeman * Can you spot the beetle? This past summer in Texas was mild, as these things go, and a very productive time for me. We fired the wood kiln in June and the soda kiln in August. My main project for the summer was making beetle rattles, which culminated in the 40 Beetles Project. You can view the entire album here and also read more about the project here, where you can also hear all the rattles get rattled. Currently, we are gearing up for the 23rd Annual Texas Clay Festival, held in scenic Gruene, Texas on Saturday, October 24th, and Sunday, October 25th. This is an absolute favorite time for us, so if you’re in the area, come by to see us smiling. Find more info at Texas Clay Festival. Lastly, I have reopened my Etsy shop. There are some things already available, and more to be added. Check it out and let me know what you think. Summer is here and I have (too) many projects I want to tackle. I don’t quite know what the end result is going to look like, but I know I need A LOT of beetles. So I’ve started making a lot of beetles; hopefully I will figure out the rest out as I go along. Previously when making small rattles, I would make two mini pinch pots, add a rattle, then seal them together. I like the effect on the rattle sound that the pinched, compressed clay makes. However, using the slump mold, I can make about 10 times as many rattles as the pinch method in the same amount of time. The sound is a bit different, but still interesting. Since sound is one of the elements that I am interested in, I’ve been taking careful notes about what is inside each rattle in relation to the surface design. The book Pheromone by Christopher Marley sits nearby, so I can steal design ideas from some amazing arthropods. Some finished beetle rattles, as you can see by the pencil, fairly small in size. I’ll post ongoing process pics over on facebook, any input or ideas are most welcome! This past weekend, we fired up the soda kiln (for the second time ever!) and also the wood kiln (for a record 34 hour long firing). Overall, the results are good. Now I can't wait to get back in the studio to make pots to fill up the kiln again. It is a good life. We are taking a slow paced road trip to the pottery mecca that is North Carolina, starting along the southern route, then making our way back through Tennessee and Arkansas. 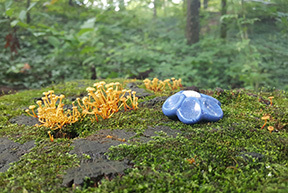 In anticipation, I made a series of blue porcelain flowers, which were fired in the wood kiln at Baylor. Along the way, I will leave a flower and a hand drawn calling card wherever the mood strikes me. If you are interested to see the pairings in place, check out my Facebook page. I might also post some images on Instagram. Happy trails!